Any superhero team-up that brings together such diverse characters as those of Unity are going to have trust issues between them. Its been seen in various superhero team-ups over the years, even the X-Men who are much more of a family than just a team. However, using that as a part of your first arc on a new series? Well, that’s a bold step, and it is one on which writer Matt Kindt almost sticks the landing. We saw overtures of this in last month’s issue, and this is the issue where it all goes down. The pacing of the story is bothersome since it was entirely too fast, and I would have liked to have seen another issue being worked in for this story, but when all is said and done, I think that this approach works out too. Matt Kindt hits all the broad strokes in this here issue, and that’s the most important things. He has had to establish this particular team on the go so that he can get right into the meat of the story month after month, so perhaps that has been a drawback (magnified by this issue), but its not all that big a criticism really. 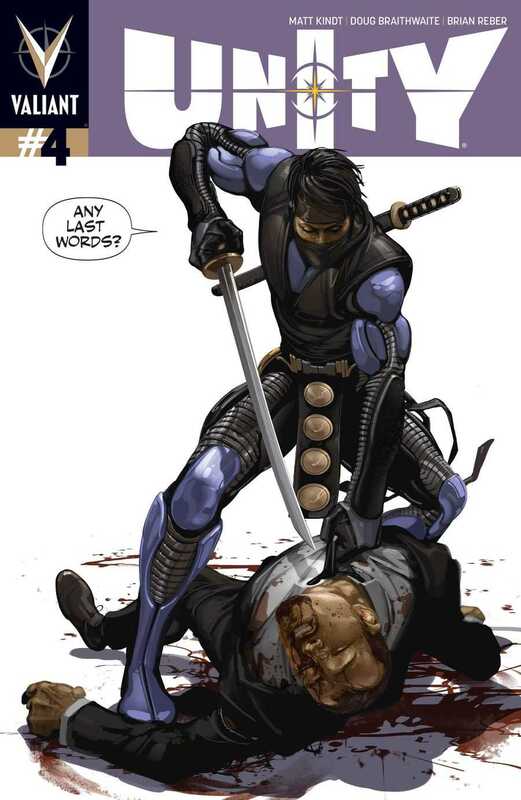 I love what he did with Livewire and Ninjak in this issue, and even Gilad and Harada. He’s made them characters that I can root for, characters I can support, even if I don’t like them as heroes. There is so much of a personality to each of the characters. They stand on their own, with their differences and their similarities, and it is all worked in fairly nicely for the greater whole. As I might have said before, I really wish that Matt’s run on Justice League of America was as good as this. The breadth and depth of the story on this series is something that I would love to see on Justice League of America, not that we are going to get that chance since that series is getting cancelled soon as the Forever Evil event wraps up. But still, Unity #4 was a pretty damn awesome issue. It had some excellent action as the three members of Unity all went up against Harada, and the emotional impact of the story was certainly felt. Especially at the end when Livewire makes an extremely generous gesture. It certainly fits her character I’d say. Matt Kindt gives penciller Doug Braithwaite lots of opportunities to turn out some great visuals. The action scenes have some of the best art in this issue, with colourist Brian Reber doing some excellent work on his own. Aric of Dacia, the former occupant of the X-O Manowar armour looks a bit weird in certain places, but overall, the art in this issue is some of the best that the team has turned out so far. The art is gorgeous, lively, and… kinetic. The story flows smoothly from panel to panel, page to page. Its awesome to see how well Matt and team have wrapped up the first arc of the series. At least, I think this issue marks the end of the first arc. It feels like a natural ending, and that’s what matters I suppose. Bring on the next issue I say! More Unity: #1, #2, #3. Posted on February 26, 2014, in Comics Reviews, Review Central and tagged Action, Aliens, Aric of Dacia, Brian Reber, Comics, Comics Review, Dave Sharpe, Doug Braithwaite, Eternal Warrior, Gilad, Gilad Anni-Padda, Harada, Livewire, Matt Kindt, Mercenaries, Ninjak, Psiots, Review, Review Central, Science Fiction, Space Opera, Superheroes, Toyo Harada, Unity, Valiant Comics, Visigoths, X-O Manowar. Bookmark the permalink. 9 Comments.